I thought this would be a really nice gift for someone and it's limited edition! I wanted to post this as soon as I could in case it sells out in stores. 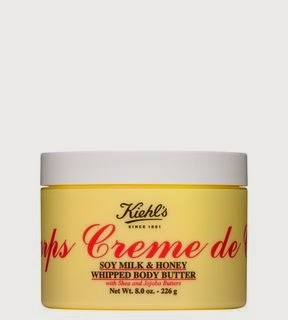 The Creme de Corps Soy Milk and Honey Whipped Body Butter is a Kiehl's classic and you can purchase it year round but for Christmas they changed the lid to be a childrens picture. 100% of the net proceed from the body butter go to charity in Canada, I' m not sure if this is offered anywhere else. The charity is Canadian Association of Pediatric Oncology Camps (CAPOC), and my particular Kiehl's in Sherway Gardens Mall was donating to Camp Ooch which is a camp specifically for children with cancer. The price of the product is expensive, it's $45 CAD but as I mentioned before all the proceed go to charity and the product is really amazing. Christmas is the perfect time to donate to charity, and this way you get a really luxurious body butter out of it. You can see it online here but it seems to be out of stock online. There was a handful left in my Kiehl's location so I'm sure there's more in store! They had a tester out as well so you could smell it and try it. I love whipped body butters, as they're not super heavy but very hydrating. It has Jojoba in it as well as shea butter and it leaves my dry winter skin feeling great. The smell lingers and it's not a perfumey scent, it's subtle but so nice. You have to smell it in person to actually understand. Also, Kiehl's is good with samples so if you go in to test out this product and buy one, they typically load you up with their little packs of product. If you click the link I attached above you can see what the lid looks like for the limited edition one I'm talking about. Definitely a good gift for a friend, family member or even yourself. It's a great body butter for a great cause. If you don't live in Canada is your Kiehl's doing anything like this? Have you found any other products that are limited edition like this that donate the proceeds charity?